Restored, modernized, transformed, to serve the spiritual needs of Utah’s Catholics in the 21st century. 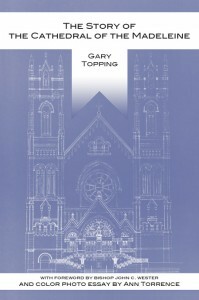 In celebration of the centennial of the dedication of the Cathedral of the Madeleine in Salt Lake City, Gary Topping’s timely book narrates the founding and growth of the Catholic church in Utah through the perspective of the construction, embellishment, and restoration of the Cathedral in its first 100 years. Gary Topping is Professor of History at Salt Lake Community College and archivist of the Roman Catholic Diocese of Salt Lake City. Topping has published widely on a variety of Utah and western topics including Utah Catholic history. Among his recent books are Glen Canyon and the San Juan Country and Utah Historians and the Reconstruction of Western History.